How can we enable productive collaborations on the issue of forced migration? Who are the intended audiences of the artistic practices by or about refugees? How can we create a third space for dialogue about refugees that is not political or personal, but social? These are just a few of the questions raised by participants at our inaugural workshop at Keele university in October. Interrogating the ideas underpinning the project in critical and productive ways, the contributions from participants will help shape the network and our coming events in Naples and at Royal Holloway in London. Our aim was to share knowledge, skills and experience in the area of forced migration and we heard from academics, arts practitioners, and those who work in the voluntary sector. We gained valuable context in the form of the historical legacy of colonialism from Roger Bromley, and Neelam Srivastava raised important questions about contemporary and historical practices of commemoration for refugees, showing a clip from Dagmawi Yimer’s 2013 film Asmat/Names. Taking us into the mechanics of seeking asylum, Anthony Good and Carolina Albuerne spoke from their research and practice with asylum claimants, exposing the inadequacies of current systems for applying for asylum and raising crucial questions like: how can we get better at facilitating refugees to speak for themselves? What constitutes self-representation? And how can we be better advocates with a sense of our own positioning? Kristin Shirling, who has been working with Good Chance theatre in the Calais ‘Jungle’, voiced her strong support for the role of the arts in situations of crisis, arguing that when one is dehumanised, a place to ‘be a human being’ is vitally important. Jerome Phelps’s discussion of the spatialisation of power worked across scholarly and practice-based approaches to forced migration by grounding his comments in the campaign against the UK Government’s detention estate run by Detention Action. 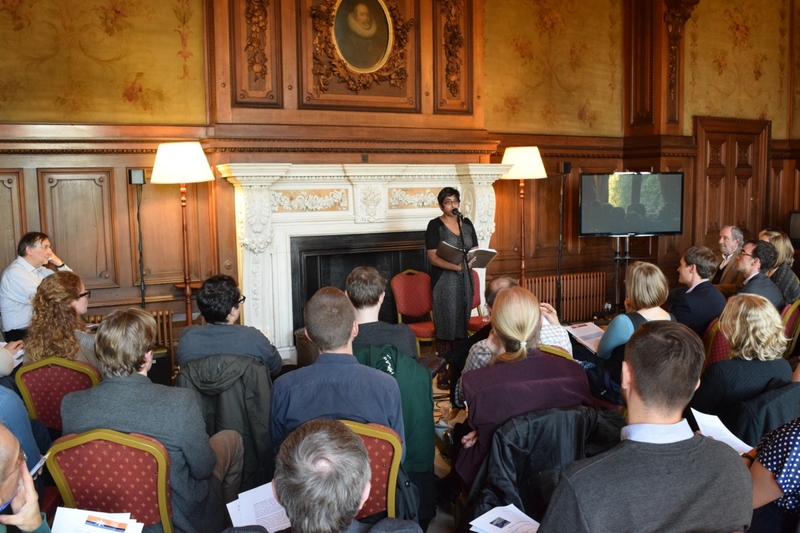 An evening of poetry and film at Keele Hall (which, incidentally, had a brief incarnation as a refugee camp during WWII) forged connections between the arts and the ideas and questions that had arisen during the day. We heard from poets James Sheard, Saradha Soobrayen and Robert Hampson and the audience were encouraged to participate through ‘Pebble Poetry’. Pebbles inscribed with words, phrases and responses from participants will travel from Keele to Glasgow, to Naples and to London, building a shore to safety and offering a welcome written in stone. See the gallery for more pebble poetry.